One of the key problems for roboticists trying to create robots small enough to work side-by-side with us humans in the home is to balance portability with computational power. An intriguing possibility is the RoboEarth Cloud Engine, which would allow your home robot to make use of computational resources based elsewhere. This video shows examples of how the RoboEarth Cloud Engine may help tomorrow's robots to increase their performance by leveraging the computational, storage, and communications infrastructure of modern data centers. The current Alpha release of the software framework allows developers to create their own robot cloud services. A number of robot cloud services, such as those illustrated in the video, are already under development. More recently, In the 2004 movie I, Robot, the advanced NS5 robots had a special feature: additional software and instructions could be downloaded wirelessly to individual robots. 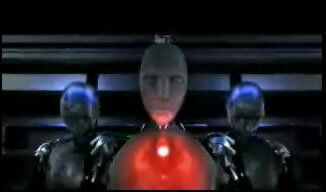 NS5's receiving a download show a red glow in the chest cavity.